So, you’ve made the decision to buy a new Silencer cattle chute. Congratulations! You’re getting the best hydraulic squeeze chute on the market today. At A.L., we build your chute to your specifications, install it for you and show you and your workers how to use it. You’re going to benefit from all the features you need to keep your operation running smoothly. The angled, louvered blinds on the Silencer cattle chute work to keep the animals from seeing humans in their flight zone when they enter the chute, and reduces hesitation in moving forward to the head doors. The operator’s line of sight is not impaired. Silencer’s optional rebar floor is constructed of three-quarter inch high tensile rebar, with three-quarter inch spacing in between. This allows the manure to drop through the floor, keeping the chute as clean as possible during processing. Silencer drop pans are made of 45000 PSI steel, and provide full access to the lower portion of the animal. The doors can be removed easily simply by lowering it and sliding it to one side. The Easy Access Lower Leg Doors can be added to any Silencer model chute. The complete opening lower doors allow for added operator efficiency and safety while gaining access to the animals lower body. Silencer’s hydraulic neck bars provide more neck access by controlling the animal’s head three ways: left, right and straight ahead for vaccinating, mouthing, drenching, tagging, RFID, ect. 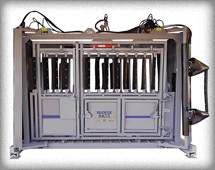 This control adds to the operators’ and animals’ safety and promotes efficient flow with no need to reset the bars for each additional animal or adjust the bars based on the various sizes of cattle. The neck bars provide 16 inches of extra neck access per side gate for precision vaccination placement. Soft rubber cushions on the hydraulic head restraints and neck bars provide a quick efficient way to control head for vaccinating, mouthing, drenching, and tagging or other access to the neck area.